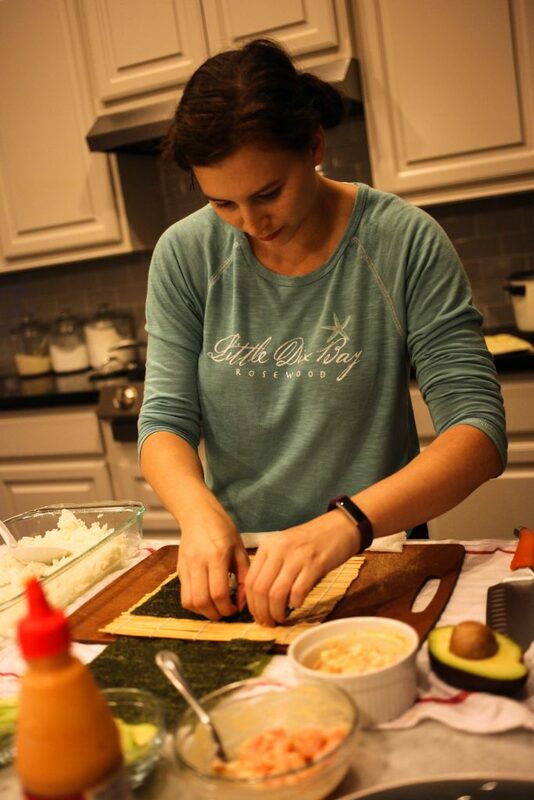 It turns out that you don’t have to train for 30 years to make sushi at home that tastes amazing. 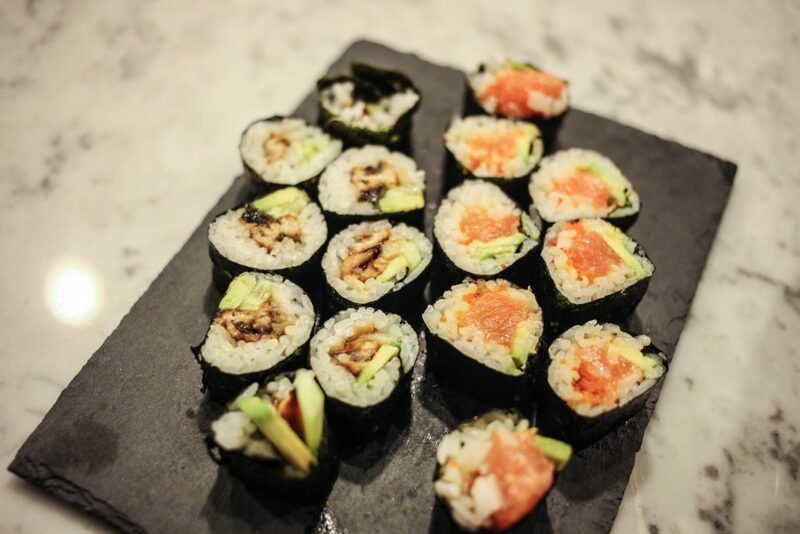 Every time I decide to make homemade sushi, the results astound me. With no formal training and my only real guide being my personal obsession as a consumer of the japanese favorite, it’s surprisingly doable. I won’t say that it’s easy because it takes plenty of preparation and specific ingredients that aren’t always easy to find. 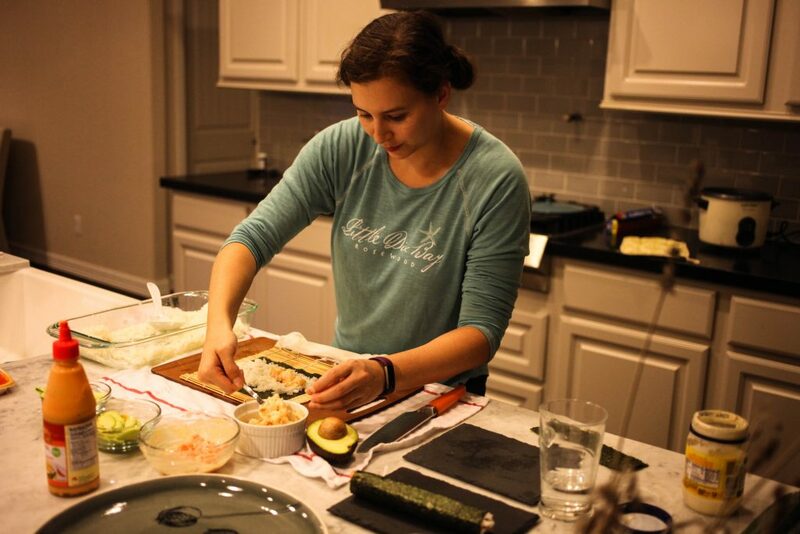 But if you have the determination and a passion for sushi, it’s doable. Here is my fairly, foolproof method. As I mentioned before, the ingredients are not something you will find in your neighborhood grocery store. Here in Houston, I went to the newly opened Seiwa market. In Seattle, I used to go to Uwajimaya. If you have an H-Mart, that works too. Basically, you need to go to your local high-end japanese or korean supermarket. 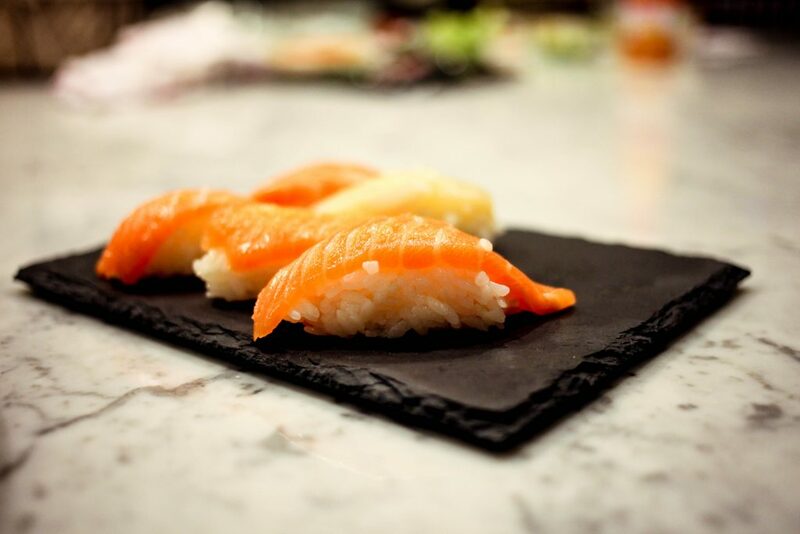 Then you should have your pick of fresh “sashimi grade” fish. Today I chose salmon, scallops, and unagi. 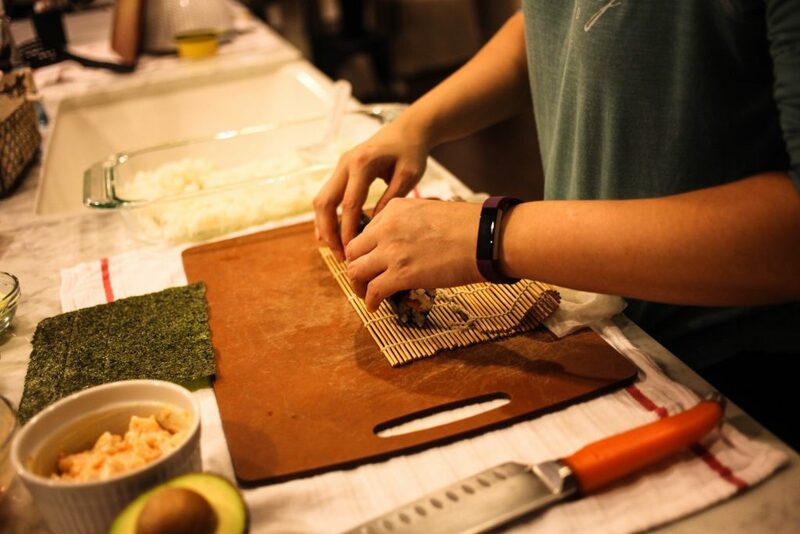 Sushi-making is a time sensitive activity.  It’s best when served fresh. So I normally make myself an assembly line of sorts. 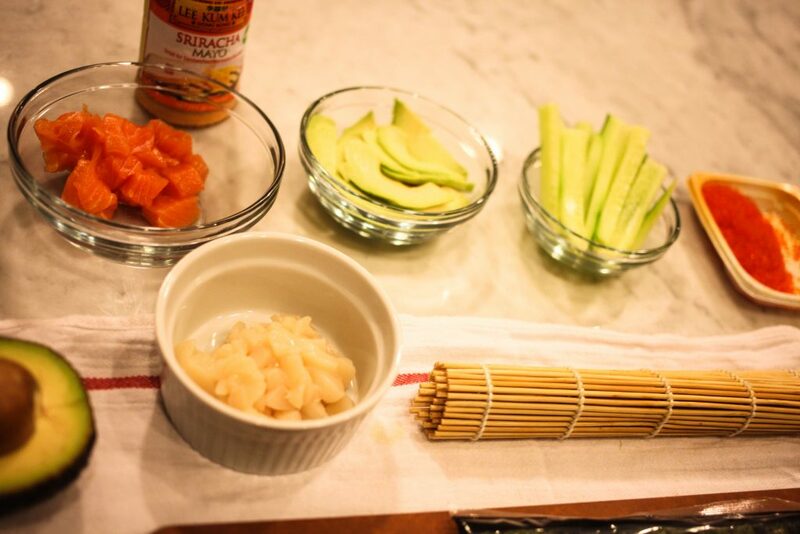 To prepare, I cut up all of the veggies, slice the fish for nigiri style (individual pieces) and chop it for maki (rolls). Oh yea, you’ll also need one of these sushi rolling thingies. You’ll find this at any asian market most likely. My final preparation is sharpening my knives. This is super important because a dull knife will surely mess up the assembly line. 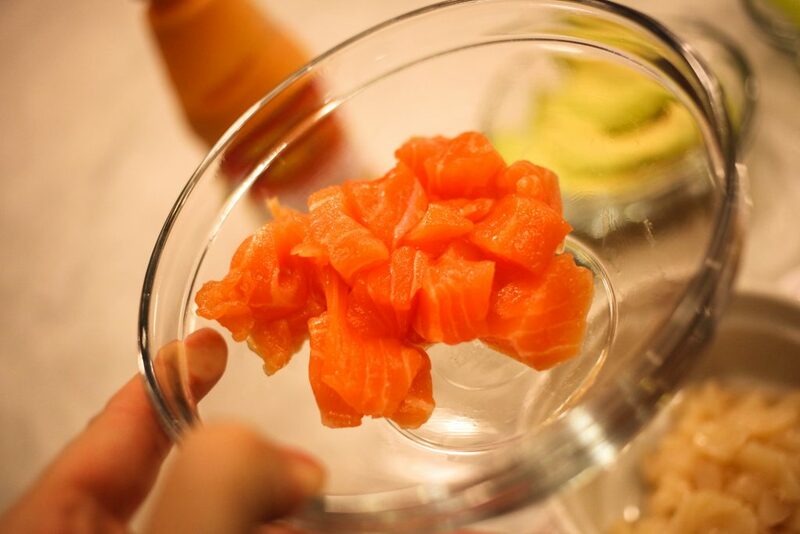 Quick tip: For my maki, I like to have big chunks of fish that are just lightly coated with spicy mayo and sometimes masago (the little orange eggs). I’m not into mincing the texture beyond all recognition. 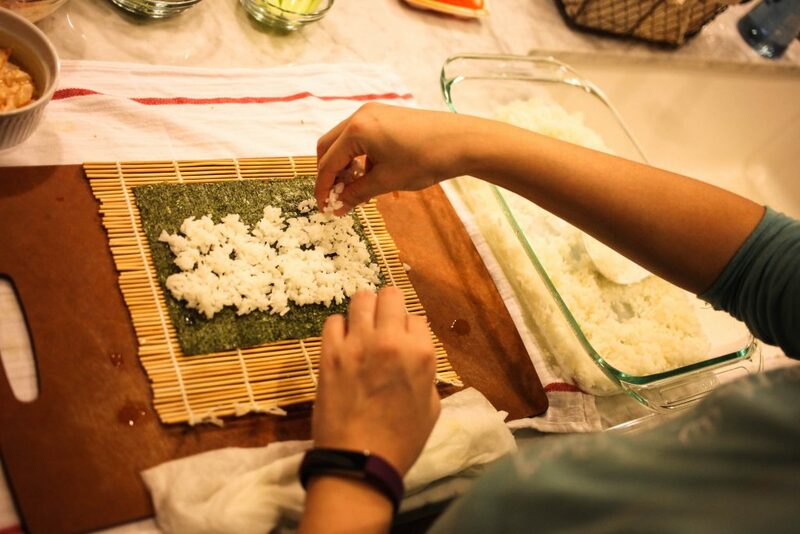 The rice is probably one of the most important parts of homemade sushi. 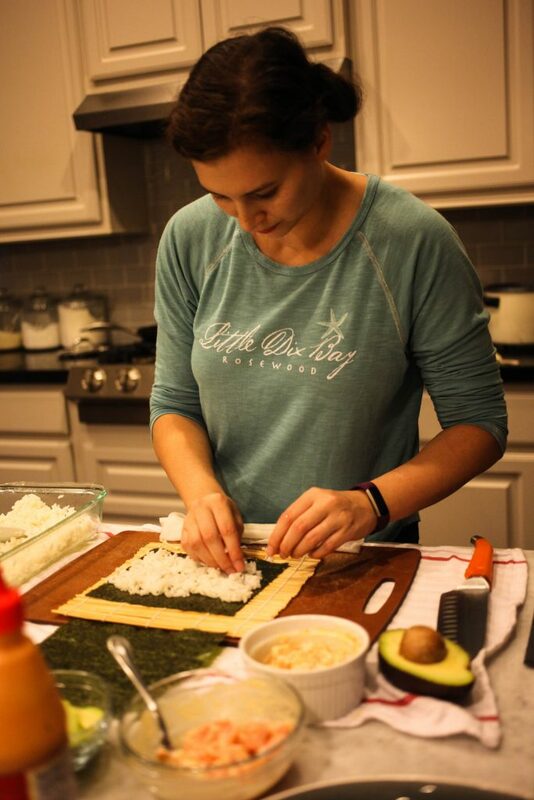 It’s what I think makes homemade sushi so good and sometimes better than restaurant sushi. I love for my rice to be room temperature to almost warm so that you can really taste the vinegar. 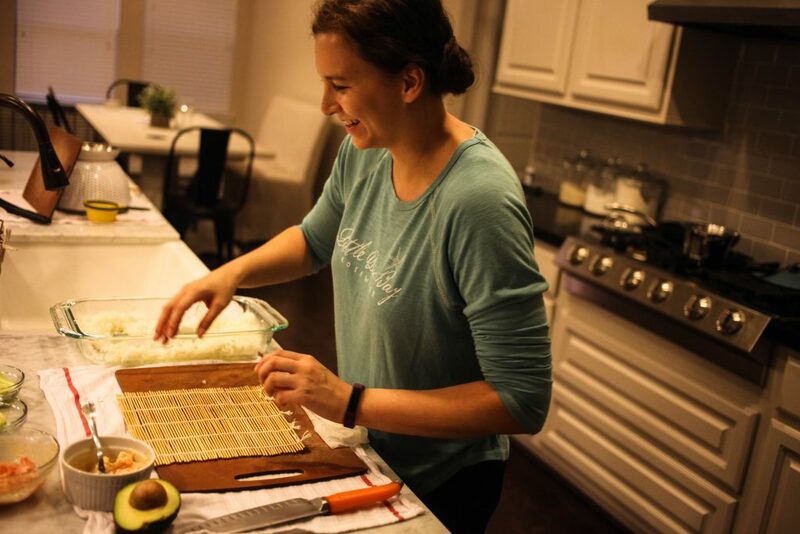 My go-to rice recipe is this one from the Pioneer Woman. Probably seems a strange place to get a sushi recipe from but I’ve had success every single time. My only recommendation is to use the su to your taste. Don’t dump it all in because I find that can be overpowering. Add about half, taste and add more if you need it. Ready, set, go! It’s a race against time. I like for the rice to be almost warm but I want my nori (seaweed) to be crispy! So it really is a race. Rinse and repeat. No seriously. The sushi rice is way easier to handle with wet hands! Otherwise it sticks EVERYWHERE. So I usually wet my hands lightly when pressing the sushi onto the nori and then dry them because I don’t want the actual nori to get wet. Ta-da! You’ve done it! You are a master sushi chef now. Ok ok, so it doesn’t look perfect. And it’s not professional. But I’ll be damned if it isn’t some of the tastiest sushi I have ever had. Seriously, it gets me every time. Credit for the photos of me goes to my husband Tommy. sushi rice from your favorite recipe. I use this one. When I am cooking for two, I do about 1 1/2 – 2 cups of rice and usually make a little too much. 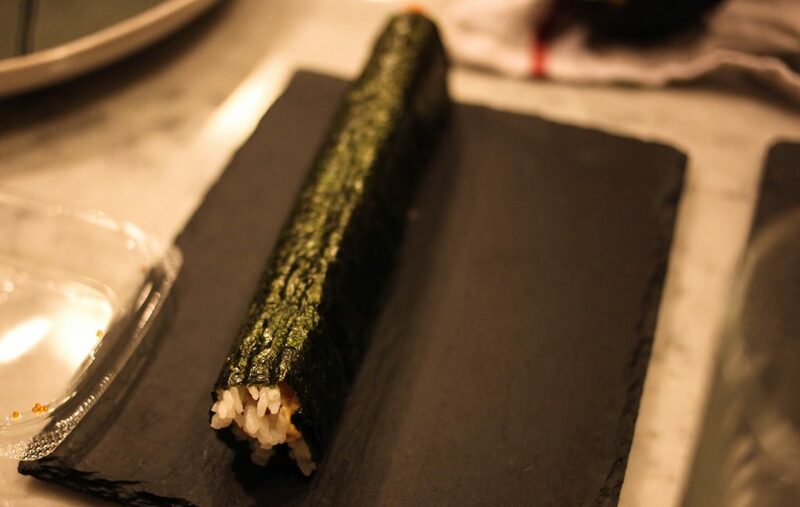 Lay out the nori on the sushi roller…thing. add a layer of rice. I don’t cover the entire length because I find it makes the rolls too fat so I cover the middle two thirds. add toppings. These were my combos today: spicy salmon with masago, cucumber, and avocado; unagi with avocado; spicy scallop with masago. 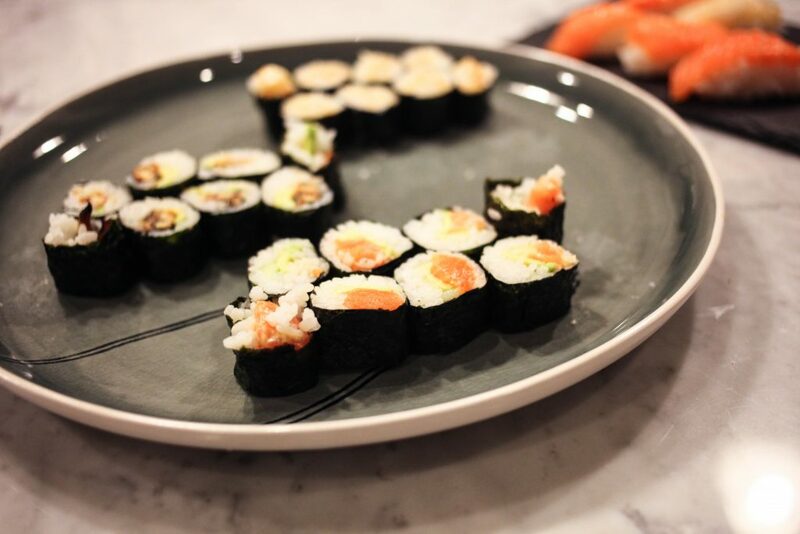 Using the sushi roller, roll once to cover all of the toppings. Press firmly with your hands around the roll. 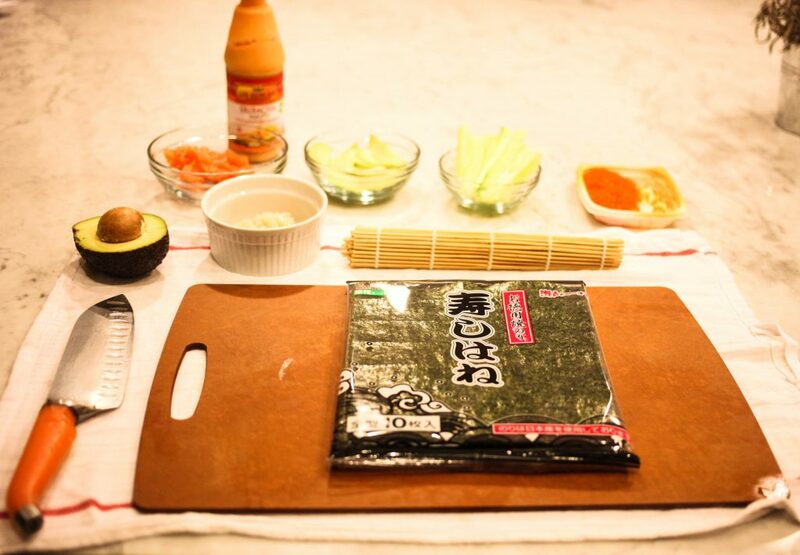 Roll the sushi the rest of the way and press firmly again. Do this until you are out of rice or other ingredients. Now you are ready to cut. I learned this from working in a sushi restaurant. The easiest way to cut rolls is to cut the middle first and keep cutting in half until you have 8 pieces. For example cut the roll in half. Cut that half in half. And then cut that half in half. Makes them all even! 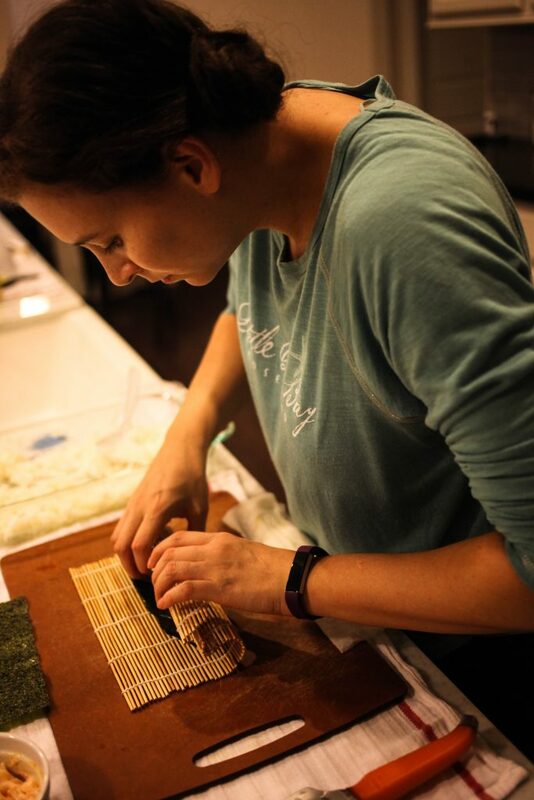 Maki-ing sushi like a pro- I’m super impressed! I just went to Seiwa the other day and was amazed at how fresh the sushi was. Keep writing cooking posts! Aw thank you! This was one of my favorite posts to write so far! Love this post. You make something pretty complicated look very easy. Will have to visit Seiwa when I get back.